Thank you Martha. We lost our sweet boy May 4, 2017. His passing affecting me so much as I worked from home and he went everywhere I went with me. He was such a sweet small boy and brought us so much joy. 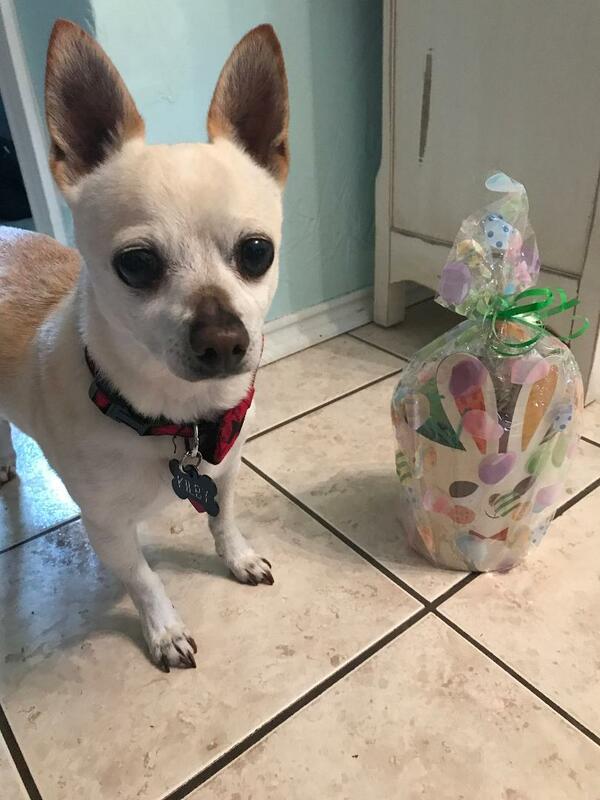 Here’s one of his last pictures with his Easter basket. Blessing and we love the work your org continues doing and will support whenever we can! This entry was posted in Rainbow Bridge, Uncategorized on September 23, 2018 by Amy Drouillard. Join us for the 14th Annual Adopters Reunion! Bring the family for a great day in the park! Enter Huffhines Park from Apollo Road (the north side of the park) & park in front of the pavilion. RHS will provide fried chicken, water, & desserts. Bring a side dish to share, if you would like. Silent auction, games, contests, & more! or calling 214-762-7520 to leave a message for the reunion committee. Please let us know how many adults, children, and dogs will be attending. Also, please tell us the original name of the pet(s) you adopted from RHS. Please note: All dogs must be on leash & wear rabies tag at all times in Richardson City parks. This entry was posted in Uncategorized on April 20, 2015 by Karen Bearman. Nov 3 & 4 – Dine Out at Applebee’s and Help RHS! On Monday and Tuesday nights, Nov 3 & 4, when you bring this flyer into Applebee’s in Richardson, a portion of your check will be donated to RHS. The generous Applebee’s hosting this fundraiser is located at 125 N. Plano Road in Richardson (the corner of Plano Rd. and Beltline, in between Wendy’s and Winfield’s Jewelry). You must bring in the flyer, so please remember to print it out and bring along. Please share with your friends, family and co-workers! THANK YOU!!!! This entry was posted in Uncategorized on October 19, 2014 by Karen Bearman. Nova (fostered by Gladys Fung, then by David and Caitllyn Banowsky). Thanks to ALL who help these dogs along the way and made it possible for them to find their forever homes! This entry was posted in Happy Beginnings, Uncategorized on September 13, 2014 by Amy Drouillard. Look out Westminster! Jimmy is coming! Jimmy, a Richardson Humane Society alum, is going to be competing at Westminster this year! An agility champion, Jimmy was chosen as one of only 15 mixed breed dogs being allowed to compete in Westminster’s agility competition on February 8. For 138 years, Westminster has not welcomed mixed breeds in competition but changed the rules this year. Adrienne McLean, Jimmy’s mom and handler, also adopted Judy, another mixed breed, from RHS and they started doing agility to help Judy recover from hip surgery. They’ve stayed in touch with RHS over the years and attended our annual reunions when their schedule allowed. Adrienne and Jimmy are featured on the front page of the Dallas Morning News today! You can watch the Westminster agility finals competition will air on Fox Sports 1 at 6 p.m. on Feb. 8. You show them, Jimmy!!! This entry was posted in Uncategorized on February 1, 2014 by Karen Bearman. The 13th Annual Adopters Reunion will be Sunday, April 13th, from 1 p.m. to 4 p.m. at Huffhines Park in Richardson. The reunion is proceeding as planned despite the rain, in the covered pavilion at the park. This entry was posted in Uncategorized on January 31, 2014 by Chris Bearman.